For the second year running, The Belfry Hotel & Resort has been crowned England’s Leading Resort at the prestigious World Travel Awards. Despite stiff competition from some of the finest resorts in the country, the world class offerings at The Belfry were enough to see them claim the title once again in Sardinia over the weekend. 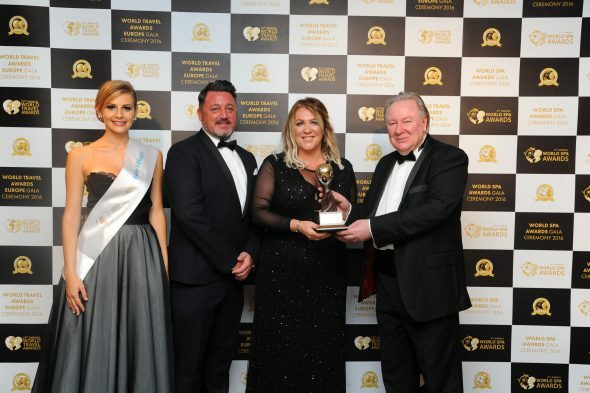 There on the night at the lavish ceremony at the Forte Village Resort were The Belfry’s Sales Director Katie Niland and Account Director MICE Darren Jones, both delighted to be collecting the award on behalf of the resort. The awards look to promote and develop the global travel and tourism industry by recognising excellence. Searching for resorts that boast the highest quality facilities along with leisure attractions and services of a similar standard, the victory underlines The Belfry’s status amongst Europe’s elite. Set against the backdrop of 550 acres of North Warwickshire countryside, yet still just 20 minutes outside of Birmingham city centre, The Belfry Hotel & Resort is a stunning setting famed in recent years for being the perfect destination for families looking to make use of the vast number of leisure facilities, as well as a hotly sought after location for conferences, meetings and events. The leisure club at the resort provides a wide variety of treatments, complemented by their unique Fire & Ice experience through 12 bio-thermal rooms. On top of this a brand new state of the art spin studio has also been installed. Fine dining is a real speciality of The Belfry, with gastronomic excellence on offer at their signature restaurant The Ryder Grill. In addition to this, The Ryder Kitchen, Rocca’s Pizza Pasta and Sam’s Club House supplement the already impressive offerings at the resort. With other amenities including 20 conference & events spaces capable of holding over 400 guests and boasting 319 signature rooms that include 15 suites, The Belfry Hotel & Resort truly offers the all-round package worthy of the title of England’s Leading Resort 2016. For reservations please visit www.thebelfry.com, email enquiries@thebelfry.com or call 01675 238 600. The Belfry Hotel & Resort, Lichfield Road, Wishaw, Sutton Coldfield, West Midlands, B76 9PR.